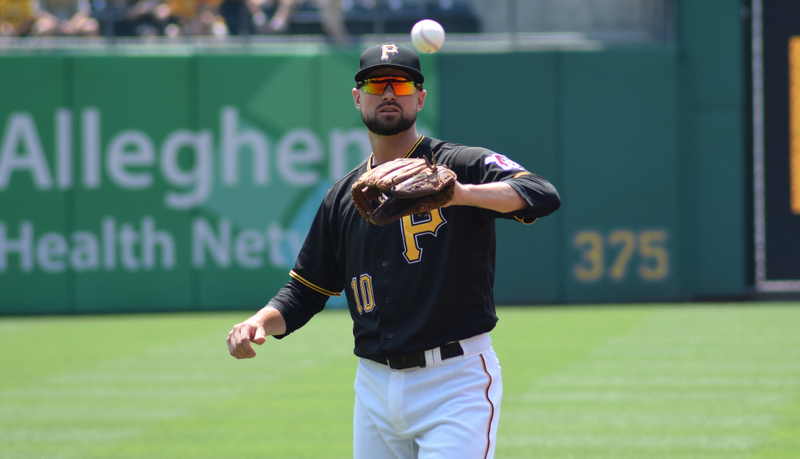 The Pirates’ hot streak has them in contention, but Jordy Mercer may not be cutting it at shortstop. We live in amazing times when it comes to the collection of talent that is occupying the left side of the infield — or is supposed to be, if not for injuries (we miss you, Corey Seager, and please come back soon, Carlos Correa and Josh Donaldson). Remarkably, at a position where defense reigns supreme, shortstops as a group are hitting for a collective 99 wRC+ at this point, up from the range of 87 to 92 that it’s occupied since 2002. Third basemen are at a high as well as far as offense with a 108 mark. And in case you haven’t seen the highlight reels, there is no shortage of guys from these two positions who can Pick It. As it happens, nearly every contender this year — which for this series I’ve defined as teams with playoff odds at least 15.0%, a definition that currently covers 16 teams — is outfitted well enough at the two positions, having balanced offensive and defensive concerns such that there’s a dearth of Replacement-Level Killer candidates. Only three teams from among the eight who have received less than 1.0 WAR from their shortstops are contenders, and likewise, just three others from among the 10 are in the same situation at third base. One team has needs in both areas, namely the Pirates, whose 11-game winning streak has pushed their odds above 15% and thus forced me to include them in this exercise, even though you, I, and Bob Nutting all know they’re still very long shots. Thus, I’ve combined two installments of the Killers into one. Remember, here I’m less concerned about these teams’ eventual solutions via trades; that’s an area that colleague Dan Szymborski will examine. All statistics through July 24. Rk = rank among all 30 teams. It’s no wonder that they made a run at Manny Machado, because the Brewers have gotten a collective sub-zero contribution from the six players who have manned shortstop for them. Orlando Arcia, a 23-year-old former consensus top-10 prospect, is back in Triple-A after hitting just .197/.231/.251 (27 wRC+) with a 4.2% walk rate; even with above-average defense (4.5 UZR, 9 DRS), he’s at -0.6 WAR. Former White Sox utilityman Tyler Saladino, who’s done the bulk of the work (24 starts and counting) during Arcia’s two stays in the minors, has been a solid upgrade since arriving via trade, hitting .277/.337/.436 (107 wRC+) with 0.5 WAR as a Brewer. The sudden loss of Brent Suter to Tommy John surgery may have bumped the team’s rotation needs ahead of those at shortstop and second base, where Jonathan Villar made the Killers list as well. The team does have a good minor league system and depth from which they can deal, but here they may opt to gut it out and hope that some combination of Saladino and/or an improved Arcia can get them home. Rookie Scott Kingery was supposed to be the team’s second baseman of the future alongside fellow rookie J.P. Crawford at shortstop, but a funny thing happened on the way to the top of the NL East standings. The team decided it couldn’t part with incumbent second baseman César Hernández and so tried to find the 24-year-old Kingery spot work at third base and both outfield corners, but when the 23-year-old Crawford suffered a Grade 1 flexor pronator strain in late April, they moved Kingery to shortstop despite him having played just two minor league games at the position in four professional seasons (he played short in high school). He’s still there, in part due to Crawford suffering a broken left hand less than two weeks after returning from the strain, but it hasn’t gone well. Kingery has hit just .234/.277/.329 (63 wRC+), and he’s been defensively average according to UZR (0.2) but not so much according to DRS (-5); with the former, he’s produced all of 0.1 WAR overall. Crawford, who has also spent time at third base despite lacking the offensive profile for the position, has been somewhat more productive at the plate (.194/.312/.333, 80 wRC+) but has struggled in limited defensive duty at his natural position (-3.8 UZR, -4 DRS, albeit in just 25 games). Crawford could be back at the end of the month, but whether either rookie can perform substantially better down the stretch is an open question. Not for nothing were the Phillies in pursuit of Machado, but they may have to settle for an upgrade on the scale of Asdrubal Cabrera or Eduardo Escobar. Through July 10, the Pirates were 42-49, 12.5 back in the NL Central and 8.5 back in the wild card, with just a 1.1% chance at the playoffs. Eleven straight wins later and they’re at 53-49, with deficits of six-and-a-half and three games, respectively, and a 19.6% shot at the playoffs. It’s certainly reasonable to be skeptical about their chances, but GM Neal Huntington has said that he’s open to adding at the trade deadline. If that’s the case, shortstop would appear to be a potential item on the shopping list, because incumbent Jordy Mercer — who totaled a pedestrian 3.0 WAR in 294 games in 2016-2017 — hasn’t done much offensively (.258/.319/.397, 89 wRC+), and things may be even worse with his defense, depending on which metric you consult (-2.0 UZR, -12 DRS). More than a full win separates his valuation between our version of WAR (0.7) and Baseball-Reference’s (-0.4), but neither is a very good place to be, and backup Sean Rodriguez, who has topped 100 innings at shortstop in just one season out of the past six, is hitting just .178/.293/.349 (77 wRC+). Whereas the loss of Dustin Pedroia and the subsequent struggles of Eduardo Núñez are responsible for the Red Sox’s inclusion atop the list of Replacement-Level Killers at second base, injuries are less of an excuse here. In his first full major league season, 21-year-old Rafael Devers has taken a step back from last year’s 58-game inaugural stint, with his wRC+ falling from 111 to 86 (.242/.292/.417) and his defense staying in the red (-3.7 UZR, -9 DRS); he’s been worth just 0.7 WAR. Playing through a bout of left shoulder inflammation that began with a June 17 dive back to first base finally landed him on the disabled list just before the All-Star break, but in the time between the injury and the stint, his wRC+ was actually a respectable 101 in 94 PA. Núñez, who covered third during Devers’ absence and has started there a total of 12 times this year, is hitting just .249/.276/.351 for a 66 wRC+ and -0.8 WAR. Late last month, the Sox signed 37-year-old four-time Gold Glove-winning second baseman Brandon Phillips, who posted a 93 wRC+ and 1.7 WAR with the Braves and Angels last year, to a minor league deal. He spent 25 games at the hot corner with Atlanta, his first major league experience there, and according to president of baseball operations Dave Dombrowski, he could see time at both positions once he works his way to the majors. With payroll something of a concern — the team is already $37.7 million over the $197 million competitive balance tax threshold and will incur an additional penalty if that gets to $40 million — Boston may have to settle for the low-budget solution here. Incumbent Jake Lamb spent a month and a half on the disabled list due to an AC joint sprain in his left shoulder and has subsequently been a shell of his slugging self. From 30 homers and a .248/.357/.487 (111 wRC+) line last year, he’s fallen to .223/.308/.350 (80 wRC+) with six homers, and in July, he’s hit for just a 32 wRC+. His defense is in the black for the first time since 2015 (1.0 UZR, 4 DRS), but even so, that’s pushed his WAR to a meager 0.3. The reinvented Daniel Descalso did the bulk of the hot corner work in Lamb’s absence but has been platooning at second base with Ketel Marte lately. Overall, he’s hit a robust .262/.378/.481 with a 130 wRC+ — 45 points higher than his career mark. Alas, the Snakes only have one of him. They showed interest in Machado, but after coming up short, they’re likely to remain in the market for outside help, albeit of a lower caliber than that. Acquired from the Astros in the Gerrit Cole trade, rookie Colin Moran has flirted with league average as a hitter (.267/.336/.396, 99 wRC+), but subpar as a fielder (-5.9 UZR, =10 DRS), en route to a flat zero in the WAR department. Platoon partner David Freese has shown slightly more punch (.278/.335/.420) with average fielding en route to 0.6 WAR. If the team were to get serious about upgrades, they might add a second baseman and hope that returning Josh Harrison to the third-base mix (he played 121 games there in 2016-2017) jump-starts his bat (76 wRC+), but that may be a stretch. We hoped you liked reading The 2018 Replacement-Level Killers: Shortstop and Third Base by Jay Jaffe! His rest of season projects still put him as a below average batter (mid-90s wRC+) and fielder (negative Def grade). His issue has always been power. I strongly suspect if his bat improves like you suggest and Josh Bell’s power doesn’t come back, Moran is going to be holding down 1B. If it improves. On the plus side, Joe Musgrove looks like a solid #3. So the Pirates probably are going to come out of that trade okay anyway.